Director Jay Roach really gives audiences an opportunity to witness Bryan Cranston’s acting talents first hand as Cranston plays the Oscar nominated role of blacklisted Hollywood screenwriter Dalton Trumbo in California in the late 1940s and throughout the 1950’s. With the rise of McCarthyism in the early 1950’s and the vindictive Committee on Un-American Activities whose sole aim was to root out the perceived communist threat within Hollywood and many other facets of American society, the anti-communist witch hunt become notorious for ruining reputations and lives of artists, actors, directors and screenwriters. Even the famous playwright Arthur Miller was perceived as a threat and his persecution was illustrated in his classic play The Crucible. Dalton Trumbo, wonderfully played by Cranston, is an unconventional yet brilliant screenwriter who becomes one of the Hollywood Ten perceived by the Committee as harbouring Communist sympathies. Trumbo was, as his friend Arlen Hird played by Louis C. K. said, a Socialist with Champagne tastes. His flamboyant cigarette smoking, his unusual method of writing screenplays in the bath, his reliance on Benzedrine were all traits of a fierce creative genius who was ripe for prosecution. Michael Stuhlbarg also gives an impressive performance as Edward G. Robinson who will do anything to maintain his lavish lifestyle. In one of the great artistic injustices, Trumbo is found in contempt of the Supreme Court and sentenced to a Kentucky penitentiary for close to 18 months. 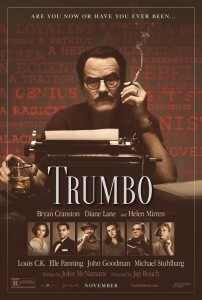 Upon Trumbo’s release he is faced with the prospect of supporting his wife Cleo played by Diane Lane (Unfaithful) and three growing children, one of which is his feisty daughter Nicola superbly played by Elle Fanning (Maleficent). 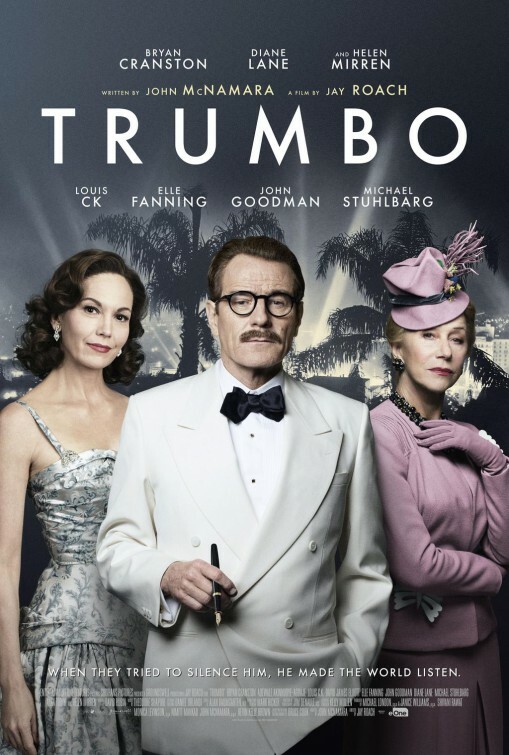 Trumbo approaches a B-Grade studio, King pictures and soon does rewrites under a pseudonym under the guidance of the studio boss, Frank King boisterously played by John Goodman (The Gambler, Barton Fink). Helen Mirren (Woman in Gold, The Queen) pops up looking suitably glamorous as the Hollywood actress turned gossip columnist Hedda Hopper who ambivalently supports the Communist witch hunt and soon suspects that Trumbo is indeed writing Oscar winning screenplays under another screen writer’s name. The Audrey Hepburn and Gregory Peck romance Roman Holiday was credited to Ian McLellan Hunter, played by Alan Tudyk in Trumbo, but was actually written by the blacklisted Dalton Trumbo. 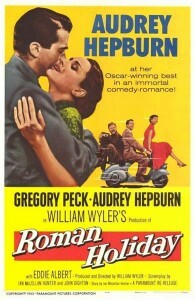 Roman Holiday won an Oscar for Best Original Screenplay and went to McLellan Hunter acting as Trumbo’s front. In steps Kirk Douglas played by Dean O’ Gorman who secretly approaches Trumbo to write a screenplay about a man taking on the world. 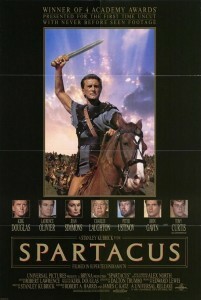 That film was to become the blockbuster Spartacus. Besides the cinematic historical value of Trumbo, the injustices he suffered both personally and artistically, what carries Jay Roach’s film, is Bryan Cranston (Argo) who never falters in his brilliant portrayal of the legendary Dalton Trumbo. Trumbo is a brilliant film, perhaps slightly uneven at times, but a fascinating portrayal of one man’s quest to get his name cleared and eventually receive the recognition from Hollywood that he deserves, especially for his talented contribution to film. Trumbo is highly recommended viewing especially for cineastes and film historians, a brilliant portrayal of Hollywood in the 1950’s and the persecution of intellectuals by the American government of the time, whose paranoia concerning the cold war with Russia reached unreasonable proportions.